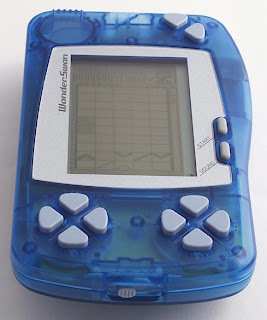 Those of you who follow me on Twitter likely are aware that the Bandai WonderSwan--aka one of the few handhelds that dared to compete with the GameBoy, GameBoy Color and GameBoy Advance in the late 1990s and early 2000s--has worked its way into my brain as of late. What prompted this (quite frankly baffling) fascination-bordering-on-obsession? Honestly, I think it was this recent post over at Kimimi's Blog. After I read Kimimi's commentary about the WonderSwan RPG, Namco Super Wars, I recalled being intrigued by a few earlier posts dedicated to games--Flash Koibitokun and Tane wo Maku Tori, especially--that were released for this odd, Japan-only portable. As much as I'd like to say this is nothing more than a passing fancy, that would be far from the truth. After all, I've already picked up a few WonderSwan games via eBay (don't worry, I'll reveal which ones sooner rather than later), and I've currently got my eye on a rather sweet looking SwanCrystal system. 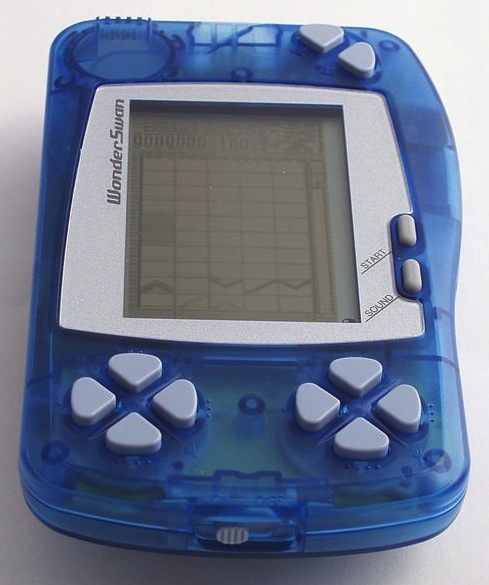 Anyway, do any of you have a WonderSwan, or have you ever dreamed of owning one, as I currently am? I'd love to get a SwanCrystal some day, but most of the games for it have a high import barrier being that they're RPG's and the like. Too text heavy for someone that doesn't know Japanese. I'll probably get a Neo Geo Portable before I get a SwanCrystal. I love handhelds and classic games, I totally have to get the more obscure ones eventually. Actually, CYM, there are quite a few import-friendly games for the WonderSwan. You're right, though, that a good percentage of them are RPGs or have a lot of Japanese text. what's up with the two d-pads? I wish to have one of this someday... It looks too cool! My girlfriend got me a Crystal for Christmas, I was delighted with it. Picked up a few games for it but it's hard picking out the import friendly games for the system and a lot are RPGs as you said. Anyway there's still a lot there to be enjoyed and some of the boxes are amazing, especially Rhyme Rider Kerorican. Love Klonoa and Makaimura on it. @Adam; Bryan will tell you this but, the two D-Pads was so that the system could be played vertically as well as horizontally, for like puzzle games for example. Anyway. Yeah I liked my SwanCrystal. I found out about the system via its Final Fantasy rereleases and some Rockman EXE games. And accessories with cool names. Like the Wonder Gate. Y'know, if yr familiar with Evangelion, in Evangelion 2.0, Asuka plays a Wonderswan quite allot. It even has the known startup sound. But whatever cartridge she's playing has a Famicom wave design. Kimimi: Ack! I forgot that you had bought a Game Gear. Which games did you buy for it? Or don't you want to spoil the surprise? Adam: Some WS games have you turn the system on its side. To play those games, you use the left d-pad for movement and the right d-pad for action buttons. Actually, at least two of the WS games I've already bought use this control scheme! I'll explain more in later posts about the system and its games, I promise. Retr0gamer: You have a Crystal already? I'm jealous! Which one/color? I want the blue one (not see-through) myself. Anyway, yes, there definitely are a number of good, import-friendly games out there for this system. Makaimura, Mr. Driller, Rainbow Islands, etc. SUIKA: Thanks for helping me explain this to Adam :) Also, so glad to see there are other WS fans out there! I bought Ristar, Royal Stone, Eternal Legend and my friend's very kindly sending me GG Aleste 2 - I;m in heaven! Wow. Someone needs to make that movie. GG Ristar's great! It's a sort-of remake of the Mega Drive version - some levels are very familiar but others are all new. There's a few new enemies in there too and some other bits and bobs, if you liked the MD game it's well worth playing.